Palin praised Heroic Media's advertising against abortion, on billboards, online and in social media. She also presented an award to Lila Rose, the videographer and activist who did a video sting operation against Planned Parenthood and worked with James O'Keefe on his sting against ACORN. "Planned Parenthood doesn't empower women, or offer women who find themselves in less than ideal circumstances any kind of real choice," she said. "What they offer is not real choice or female health care." Palin's daughter Bristol was also in the Washington area, but she attended Saturday's dinner with the president and the Beltway media instead. Palin said she advised her daughter to just grin and bear any Palin-related jokes. "Go and grit your teeth if you hear Palin jokes out there on the podium," she said. Palin couldn't be more wrong. Planned Parenhood provides a great service for women, and no, I don't mean abortion. It is possible to be pro-life and pro-Planned Parenthood when you realize the organization is more then just abortions - especially when you realize their actions do more to prevent abortion. Here is something Palin could understand: a pie chart depicting Planned Parenthood's services. 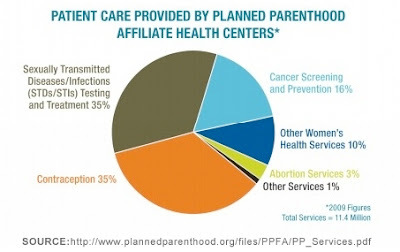 By stating Planned Parenthood does nothing to empower women is a huge falsehood. It helps prevent the spread of sexually transmitted diseases, cancer, and unwanted pregnancies. I guess Palin would love to see pregnant cancer-ridden women. What does Palin believe would happen should Planned Parenthood dissappear? There would be a rise in diseases, cancer diagnoses, unwanted pregnancies, as well as a handful of other issues that effect women, and where do you think the cost would fall then? Instead of facing the truth, Palin decided to go to a closed speaking event to speak to those who idol her. It's only a matter of time before Donald Trump announces Palin as his running mate. She says what they pay her to say. She is about as honest as Trump. And she will be no one's running mate. She is sure that had she been at the top of the ticket, she'd have beaten Obama. She is still convinced that SHE won. So, if she runs, it will not be for VP. My question is, which GOP ego-inflted male would ever run WITH her? I can't think of any. And since the true VP would be Tawd, anyhow, the question becomes, which one would be willing be play nanny and purse carrier to them both? She's running. She's just trying to figure out how many debates and primaries she can ignore before it's obvious even to her base that she's a clueless bully with a bad attitude. I think Trump was exposed last night. Her turn is coming. If Sarah would have actually checked out the services Planned Parenthood offered, she may have been able to prevent the herpes on her lip that surfaces from time to time. If she has herpes on her lip there is a good chance she has herpes on other places on her body. Planned Parenthood would have been a great resource for her. I wonder if Sarah knows that herpes is contagious and she could be infecting others. Sorry.... Palin/Trump ticket! That will be the perfect match. Every teabag PAC would explode at the thought of such a team!